Bead track works much the same way as pool liner coping does, it simply holds the liner on the pool wall. Bead track, sometimes called bead receiver, is usually made from hard plastic and runs around the entire upper edge of the pool wall. The advantage is much easier pool liner replacements in the future. By installing the bead track during pool installation, the pool liner can then be changed in half the amount of time because removal of the top ledges etc isn’t necessary as the liner snaps in and out of the track from inside the pool. This is a great idea if plans call for the addition of a pool deck or if the pool in sunk into the ground. Highly recommended in Florida for any pool recessed in the earth. If using the track you must purchase a beaded or unibead style liner. 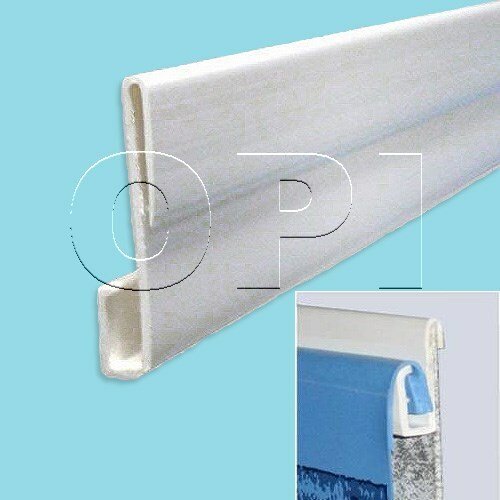 Bead track is sold individually or in kits based on pool size. I recommend buying or replacing all of the bead track at the same time for best results. Bead track does not work with overlap pool liners but many pool owners when replacing their old overlap liner will purchase a unibead liner and bead track to take advantage of the convenience this system offers.